THE true aesthetic of human rights lies in its enforcement and materialization. There are many implementation mechanisms of human rights in national and international level. While there are lots of criticisms and doubts as the efficacy of implementation mechanisms, be it national or international, scholars are unanimous on one point: creating legal awareness is a sine qua non in establishing a comprehensive regime of human rights culture. Legal awareness is not merely securing of knowledge about the law, rights and legal system; it is also about developing skills, self-confidence and determination of goals. In this paper an effort has been made to underscore the significance of legal awareness to promote, protect and fulfill human rights. When we speak about enforcement of human rights it necessarily signifies combination of 'protection, promotion and fulfillment' of human rights. a. Social campaign: As generally understood, social campaign is any explicit or implicit persuasion by non-institutionalized groups seeking public gain by attempting to change some part of the system. These are often an effort to change institutions and practices. They are usually for the purpose of furthering and ushering the rights of one or more groups within a system either through reform or more radical changes. These social campaigns are often dedicated to question the existing social chemistry and institutional structures. Given the pejorative democratic situation in Bangladesh, social movements often fail to achieve specific visible results, though accomplishments are not too meager. b. Human rights education: Effective protection of human rights provides the foundation for lasting national development and social justice. A knowledgeable citizenry equipped with human rights education is the pinpoint to achieve such a noble goal. The Universal Declaration of Human Rights identifies teaching and education as key means for the importance of the citizens knowing about and education as key means for the promotion and protection of human rights. Human Rights education, asserts Mary Robinson, is a vaccine against intolerance, animosity and conflicts in our communities and empowers individuals to stand up for their rights and those of others. The term "human rights education" evokes different images. It refers, on the one hand, to the human right to an education and, on the other, to being educated about human rights issues. To the extent that the former is partly encompassed within the broader right to general education, it is the latter that has dominated the work of most actors in the field. It is in this sense that the United Nations defines HRE as "training, dissemination and information efforts aimed at the building of a universal culture of human rights. c. Empowerment: The cardinal objective of any awareness program is the empowerment of the people - political, economic and cultural. So that the people themselves can fight challenges of human rights and so that change comes from the within. d.	Public interest litigation: One of the impacts of PIL (mostly moved by public spirited person or groups or NGOs) is that it creates a huge public attraction and attracts views from people at large. People in general become aware about recent developments of human rights through PIL strategies. e.	Train the law enforcers: To sensitize the law enforcers by proper information and knowledge of law and human rights. This is important to establish an egalitarian society. a. Promoting consumerism: Consumerism refers to a movement by consumers to ensure fair and honest (ethical) practices on the part of manufacturers, traders, and dealers, and service providers in relation to consumers. The movement may be regarded as an attempt by individual consumer activists and consumer associations to create consumer awareness about the malpractice in the market and finding ways and means to protect their interests. 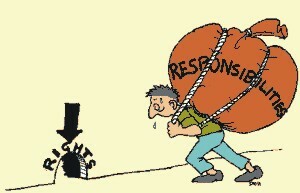 But while consumers have rights, they also have corresponding responsibilities. They must exercise general caution and maintain proof of transactions, make proper claims and ensure proper use of products and services. A conscious consumer can effectively realize the rights to him granted by the consumer law. Right to safety, right to choose, right to information, right to be heard, right to redress all are associated with a consumer's entitlement. Denial of these rights has the bearing consequences on human rights, both in particular and general. The recent melamine contamination in the milk, rid pharma tragedy on innocent children, medical negligence casualties and the paracetamol catastrophe are some examples amongst many which testify widespread human rights violations in our country. Consumer education can increase awareness of consumer rights and in the process, help prevent ongoing abuses. Such education is necessary to strengthen the consumer protection regime in Bangladesh and is the first step towards consumer empowerment. A strong consumer movement is indispensable for the benefit of the society as a whole. b. Right to information: Right to information has been the kernel of modern democratic polity. To make the people's power meaningful it is obvious that there should be availability of information. People have the right to see how their power is being exercised. Right to information law is compared with sun shine law to effectively eradicate corruption - the root evil of many human rights violation. Rightly says, Louise Brandise, 'A little sunlight is the best disinfectant'. It might be possible to reduce corruption by opening up government's doors, by shining a bright light inside and by empowering investigators/people to examine government closely to weed out waste, fraud and abuse. c.	Land rights and poverty: Professor Abul Barkat has established that land litigation causes colossal national wastage. He has firmly advocated that political economy of land litigation is the root cause of poverty. Landlessness is a culmination of unscientific corrupt record-survey system and mutation procedure. Ignorance and non-availability of land law has added drastic deterioration in this impoverishment process. This is the area where 'legal awareness has a major role to play. People should be made aware about the laws regarding usufractuary mortgage, share cropping and other land related process. It is anticipated that huge socio-economic rights violation can be checked by making the people aware on land issues. The government should establish a “Land Bank”. This land bank shall have a computerized database containing detailed information about the following: records of all disputed land including status by locations; records on khas land and jalmahal by types, locations, distribution status, disputes and conflicts; account of all vested land by types, location, lease status, and other variables; data on illegal takeover of indigenous people's land by force, fraud and manipulation, as well as subsequent disputes and conflicts (Barkat:2010). The information should be suitably classified and organized, so that it can be retrieved quickly, in forms suitable for specific purposes especially for making available to the people. d.	Family law: Marriage, intervening marriage (hilla marriage), child marriage, talaq, women's inadequate succession and access to property, dowry etc are some family grounds often culminate into violation of human rights especially of the women. The problems are largely social than legal, there by they can only be addressed by changes of attitudes in the society. Enactment of legislation is needed but mere legislation would not be effective unless it is backed by education and legal awareness. e.	Access to justice and legal aid: Access to justice is considered as the most coveted aspiration and is regarded the vital component of human rights protection mechanism. When we speak about remedy against any violation of human rights we mean it must be 'accessible, affordable, timely and effective.' The notion of access to justice is essentially based on the universal concept of equality which requires necessary institutional rearrangements through which every person has access to legal system on equal footing. By keeping mass people ignorant and away from this knowledge effective regime of human rights can never be materialized. In Bangladesh, many economically and socially disadvantaged people do not have access to justice (or they do not know that they have access to justice!) to vindicate their rights and are often deprived of basic legal services which itself constitutes a violation of human rights. The essence of legal aid, writes Krishna Iyer, consists in investing law with a human heart to ensure immanence of social justice in the jural order on the substantive and processual planes of law. How many people know that they can have the legal aid from the public prosecutors or is the government really serious to provide legal aid to the downtrodden? Whereas, social aspect of access to justice refers to making individual and groups aware of their legal rights and thus enabling them to obtain legal services to invoke their rights and economic aspect of it refers to notion of improving the efficiency of judicial system to reduce the cost of economic transaction. Role of 'legal awareness' is to be understood cumulatively from both the social and economic dimension to grasp the cause of human rights. Who to bell the cat? a. State: Modern welfare state is under legal and constitutional obligation to render services of basic necessity including education to the footsteps of the people. b.	NGOs: The complementary role can be played by the NGos developing para- legal services and letting the people know about their rights. NGOs can forge tools of legal and extra legal remedies like the PILs and the ADRs. c.	Civil liberties: The civil liberty movements can contribute to the protection, promotion and enforcement of human rights by gathering information about violation of civil liberties, particularly regarding the conditions of prisoners and people in detention, police brutality, and proscriptions on literature and restrictions on the press. d.	Students of law & legal communities: People from legal area with law students inclusive can play a pivotal role in disseminating legal knowledge amongst the mass people. e.	Mass media: Media is the watchdog and key moulder of public opinion. It has a definite role to play and voice against violation of human rights. It works as a check on the government system to fashion respect for human rights. Specially, for establishing group rights media can be a significant factor. We need a new type of lawyers and lawyering - an advocate who is ready to sacrifice the comforts of life to guarantee the dignity of millions of poor compatriots, prepared to work with the poor to organize the community, train the community leaders and provide them with the skills to confront the adversaries. These 'rebellious lawyers' can usher a change in the society for legal empowerment of the poor in the days to come. Thus, creation of 'awareness' becomes the ultimate duty-bound commitment of a rebellious lawyer. The lawyer for social change can resort to any and all of the means available at his disposal: litigation, public education, seminars, rallies, lobbying or writing for scholarly journals etc. However, the most significant of what a pro-people lawyer needs to do is: community mobilising and organising. The weak and the helpless client (in our case group-client/s) must be organised, motivated, trained and taught to resist the omnipotent state and the discriminatory legal system in order to bring about expected social change leading to empowerment of the common people. Our constitution encapsulates and guarantees fundamental principles of human rights. The constitution directs the state to set policies for the welfare and relief of the people from the clutches of 'exploitation' thereby encompassing ideas of economic and social rights in addition to fundamental rights. The people are not to be seen as a raw material of reform which in essence 'westernization' at best and 'collaborating with the colonial regime' at worst. Any awareness campaign should be focused on re-organizing people's own resources for goals of material and spiritual well-being which they were enabled to set for themselves. Awareness mobilizes people against oppressive rule and materialize people's dream. Legal awareness is certainly an inevitable catalyst to flourish the 'progressive aspirations' of the people and to vanguard their 'worth of human person'. Dr. Mizanur Rahman is Professor of Law, Dhaka University and S. M. Masum Billah is Assistant Professor of Law, Jagannath University, Dhaka. The paper is an abridged version of a presentation at a workshop in Dhaka recently.